Except: The recently widowed client, in his mid 70s, had given up hope of selling his Sacramento home and buying a new house closer to his grown children south of San Francisco. He owned his $250,000 home outright. But the median house price near his children was nearly $600,000. Bankrate: Use a Reverse Mortgage to Buy a Home? There has been a lot of talk recently about the retirement income crisis in this country. With nearly half of Americans at risk of outliving their money there is a growing focus on alternative income sources to the old three-legged stool of relying on a pension, Social Security, and personal savings to fund retirement expenses. Many retirees have significant equity in their homes. Home Equity is a potential asset that could be used to improve their retirement prospects or lifestyle. Approximately 65% of people 65 or older are mortgage debt-free. There are a variety of methods to tap into the equity in a home. A reverse mortgage is one of those methods, but there are many pros and cons to a home equity conversion mortgage (HECM). See article here. Is A HECM For Purchase Right For You? Some seniors want to remain homeowners, but not necessarily stay in their current home. 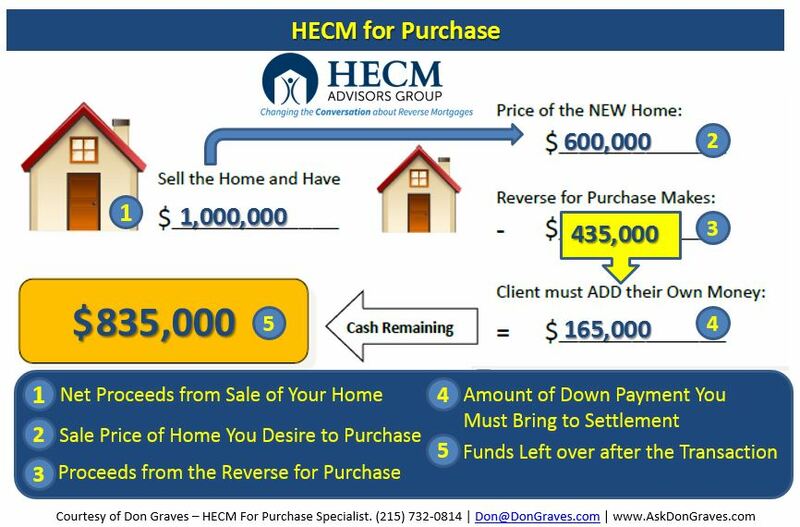 These homeowners may have the ability to use a reverse mortgage loan to use the equity they have in their current home to move to another home while doing away with their monthly mortgage payment1 by using a HECM for Purchase. A Home Equity Conversion Mortgage for Purchase often provides substantial savings over the alternative of purchasing a new home and later taking a reverse mortgage later. See article here. 95 Things Real Estate Agents Do To Sell A House – This Is Truly Amazing! If you’re a senior citizen looking for a way to leverage your home equity to buy your retirement home, you might do better with Home Equity Conversion Mortgage (HECM) than a traditional reverse mortgage. In the conventional scenario, you sell your current home to recoup the equity you have, which has probably declined somewhat since 2008, when the market turned. Then you took out a reverse mortgage on the new home. So, not only did you lose some of the home equity on your other residence, but you’re now paying two closing costs—to purchase the new home and then to do the reverse mortgage. Years ago, when you looked ahead toward your retirement, is this what you envisioned? HECM for Purchase (H4P) offers a more favorable option. This FHA-insured program lets you buy your new home using a reverse mortgage in a one-step process. You use the equity in your home to pay for your next home, which you are purchasing for a fraction of the selling price. That price is based on your age—the older you are, the lower the price. See article here. For the haters, it’s pretty clear that people aren’t saving enough for retirement. 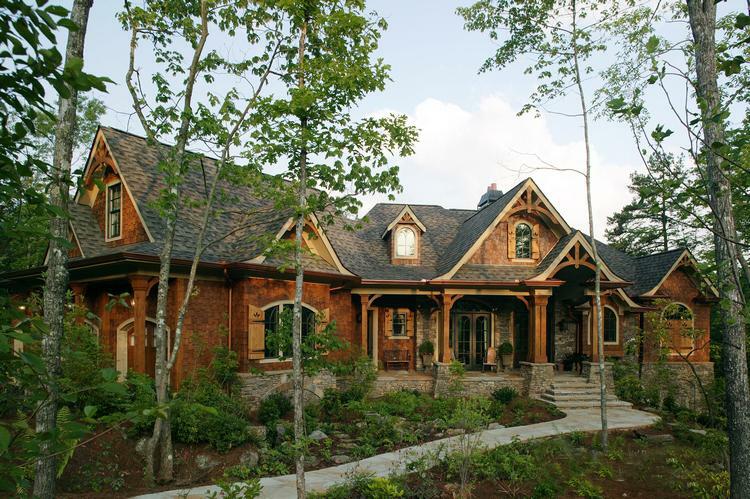 One of the places they have been able to build wealth is in the equity in their home. Untapped, it’s a reserve for future financial needs. When the need becomes more immediate, it’s a way to tap the equity in your home, without creating a monthly payment stream that a cash-out first mortgage or a home equity loan would require. See article here. Many older people know about using a reverse mortgage to tap their home equity and use the money to stay in a longtime home. But it’s also possible to use a reverse mortgage to buy a home. This can be helpful to people who want to relocate and can’t afford mortgage payments in retirement or are unable to qualify for a conventional mortgage. It may also be a useful financial tool for delaying Social Security or conserving cash. See article here. Using a reverse mortgage to help seniors buy a house works exactly the same way a reverse mortgage works when you are refinancing a home in which you currently live. The difference is that you are doing the reverse mortgage on the home you are purchasing, not on the home you are selling. The combination of your down payment, and the reverse mortgage on your new home, will equal the purchase price. See article here. For many years, seniors have used Reverse Mortgages to transform equity in their homes into cash without burdening themselves with monthly payments or risking foreclosure. This year however, the US Federal Housing Administration has enacted new legislation allowing seniors to get Reverse Mortgages on properties they haven’t even purchased yet. Not everyone qualifies for a Home Equity Conversion Mortgage (HECM) for Purchase transaction. But if you do, you can use a Reverse Mortgage to buy your dream home and escape the need for the burdensome monthly payments associated with a normal mortgage. See article here. Many people know that a reverse mortgage allows homeowners age 62 and older to tap into the equity of their homes to improve their cash flow and eliminate their monthly mortgage payments. But did you know it also can be used as a home financing tool, making it easy for homeowners to buy a different home? The Home Equity Conversion Mortgage for Purchase (also called HECM for Purchase, H4P, or reverse mortgage for purchase) is a loan program designed specifically to help homeowners age 62+ to purchase a home that’s more lifestyle-appropriate, without needing to make monthly mortgage payments. (Of course, the borrower is still responsible for property taxes, homeowners insurance, and property maintenance. A HECM is a home-secured debt payable upon default or a maturity event.) See article here. Should a Client with an $1,100 Income, Living in a 5,000 Sq. 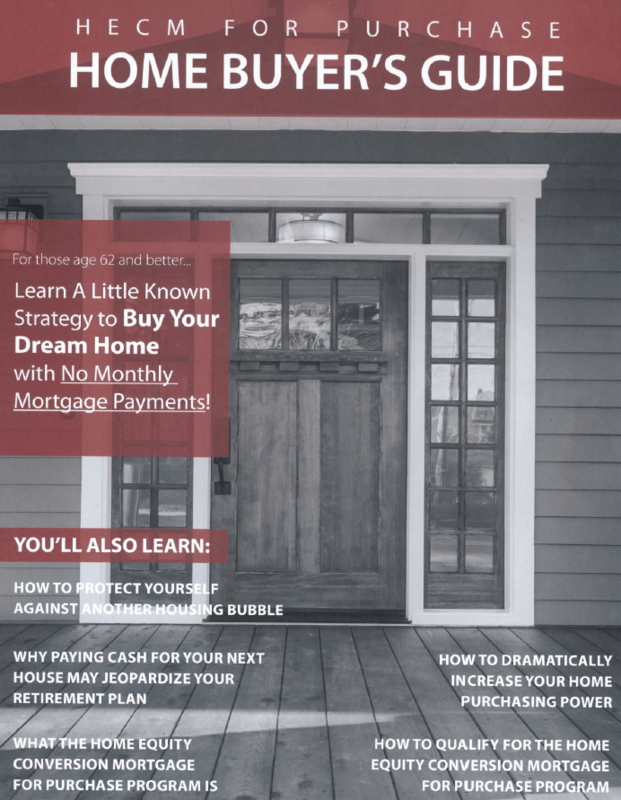 Foot Home, Consider a Reverse Mortgage? How to Add $35,000 to Your Clients Retirement with One Simple Strategy!